So, I’ve been procrastinating on this post since December 2018. I’ve analyzed why and have come up short. It’s likely that I don’t care much for self-promotion. Indeed, in the last 6+ years I can count on one hand how many times I’ve asked folks to share about my Everyday Aspergers Facebook page. (And that counts the mention here!) If you haven’t checked it out, please do. 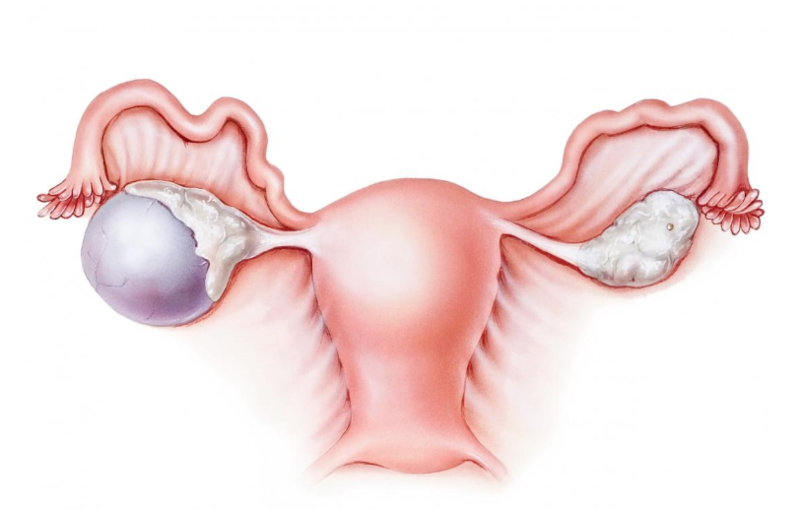 I could blame my procrastination on the countdown to menopause, which I hope and pray arrives tomorrow, as I’ve been dealing with the complexity of endometriosis for years, including the 2018 road traveled of chocolate cysts. Don’t let the name fool you; it’s all about the blood. And now that I’ve over-shared, I will switch gears. Recently, I’ve had a profound peace — could be hormones shifting and my lady parts semi-retiring — could not. (Oops, focus Sam!) I’d like to think it’s something to do with my faith and spirit. It’s likely a combination of coffee, getting older, and finally getting fed up with not speaking up for myself and finally understanding boundaries! That, and I do feel the presence of an angelic spirit. But that’s another story. Not much has changed (with my brain) in the past years, since I started writing Everyday Aspergers. Which now has over 1.4 million hits! Well, yes, some of the reason behind the high ‘hit’ number is because there are over 500 posts! Omgosh — write much? My point being, I still digress to a close-to-annoying degree. Ironically, I have studied 1000s of hours of best hiring practices for my vocation, and can’t seem to keep my Aspie-ness in a bag when under distress at an interview. There must be a pill I can take. (Now picturing Violet in Willy Wonka and the Chocolate Factory, and now must Google to find an image.) “. . . because Charlie she’s a nitwit.” Not to say I’m a nitwit. 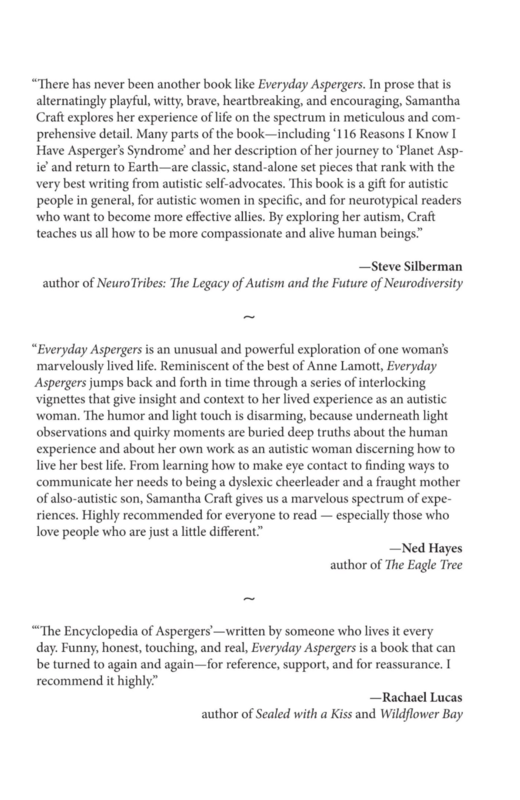 Okay, alas the REAL point of this post is to tell you THE SECOND EDITION OF EVERYDAY ASPERGERS IS HERE! And it’s now available in paperback in many countries. 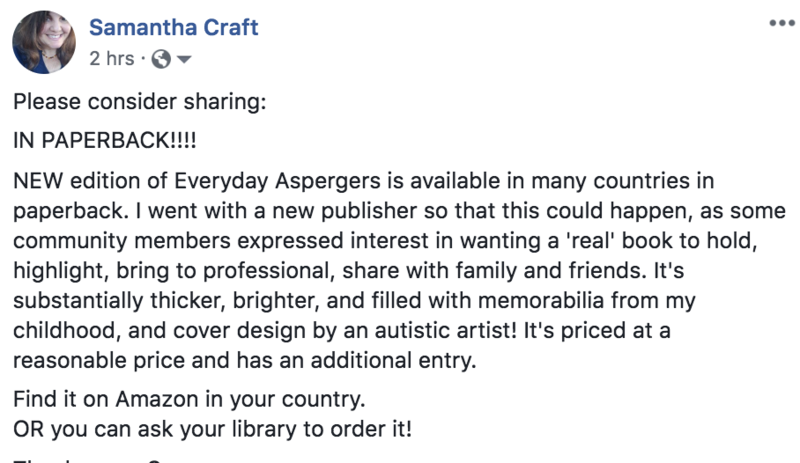 Check out Amazon or ask your local library to see if they can order it. 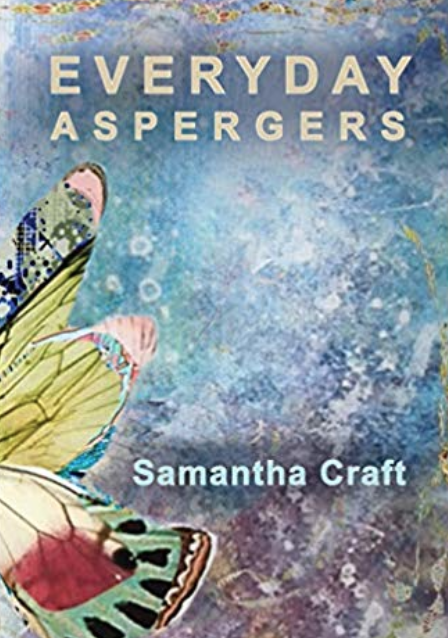 Look at the PRETTY cover by an autistic artist (and my friend and colleague)! On a side note, I will speak to you as if you and I are in a cafe, and I’m catching you up with my medical stories. Sorry for the monologue, and the white-haired man sitting kitty-corner to us that is blushing because I am talking too loud. This here ^^ … that’s an image of a chocolate cyst. Funny story … after an ultrasound in early 2018, when I found out I had at least one chocolate cyst, (and had gone to the emergency room in excruciating pain, and was curled up on couch most days for weeks) in typical Sammy-fashion, I researched with hyper-focus about the chocolate cysts and implemented some home treatments — including essential oil, strict dietary change, etc. Surely, in some cases they can? And I’d done so much, including talking to my body, to ensure healing. The next time I went back in for a check up, with said Doc, she informs that my chocolate cysts are shrinking or stabilized. So I guess we are back to calling them that? Anyhow, it reminds me of the time I had a dead front tooth, when I was in my early 20s, and I went to a dentist that a colleague had suggested I see. It was 1992, a sunny day. The dentist’s recommendation for my dead tooth’s discoloring was to darken all my teeth to match!!! Yes, that’s right. And, noooo, I did not! (On another side note: I found out this week I have no cavities and an unusually small mouth [which matches my usually small head]. And I warned the dental hygienist not to say she has a small mouth despite what her husband says, because that can be interpreted in different ways. Needless to say, I never went back to that dentist who wanted to darken my teeth! But the young, inexperienced (terrified) me did shake hysterically in her car afterward. The same way I shook after seeing a ‘specialist’ a few years back. This was after 5 ER visits wherein my pulse would go to 160 upon standing, wherein the IV would add sodium to my blood, and remedy the POTS-like reaction, making me seem better; only to be sent home and the symptoms to come back (160 upon standing, weak, shaking, etc. ); only for me to return to the ER and be told I must be inventing it for attention. Yes, hysteria is still widely falsely the diagnosis for women! No wonder I have white-coat syndrome. Fortunately, my then-husband Bob (now-good friend) was in the patient room with the ‘specialist’ (notice the quotes) and me, when the Doc told me my diagnosis and prescribed an exact treatment plan, e.g, constricting stockings, raise bed, exercise regime, salt intake, etc. A year later, I came back, feeling super pleased I’d followed the Doc’s directions, and was able to sit up for long periods of time, and return to life as normal (well atypical normal). BUT THEN . . . she SCOLDED me, accusing me of making my condition up, and saying I didn’t have POTS, and didn’t have to do all that. That I wasted my money on salt pills and where did I get the idea I had POTS?